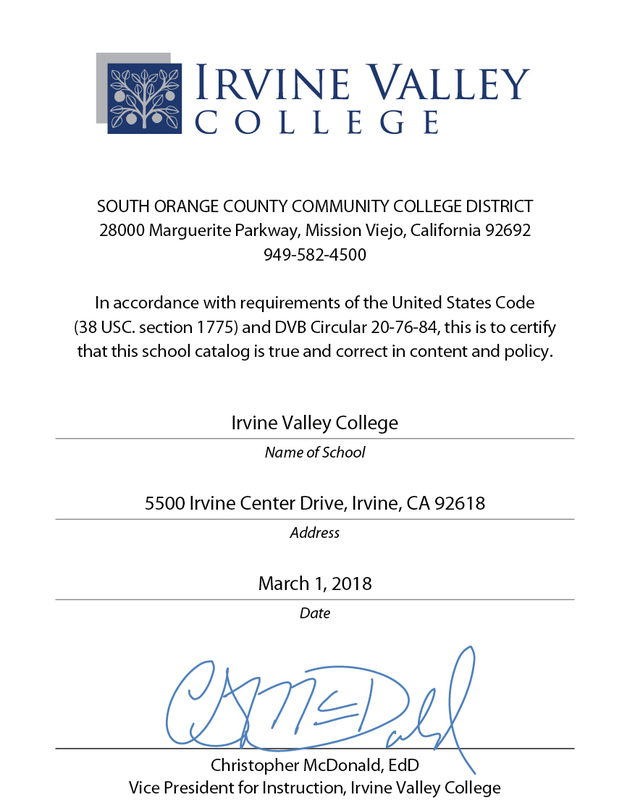 NOTE: This is the archived December 2018 version of the Irvine Valley College 2018-19 catalog. The 2019-2020 catalog is available by clicking on the white drop-down box above. Please refer to the 2019-2020 version if you need the most current information. 2018-2019 Irvine Valley College catalog! or the search feature in the top left corner. To see what has changed in this edition, visit December 2018 Catalog Revisions . To view the student handbook, or catalogs from previous years, select them in the white drop-down menu above. To print a page or save it as a PDF, select the printer icon on the top right of any catalog page. To print or save PDFs of the catalog, visit Printable Catalog PDFs . To create and save your own personalized catalog, select My Portfolio at the bottom of the left-hand navigation of any catalog page. For help, select the question mark icon on the top right of any catalog page.